Stick to your branding — or don’t. 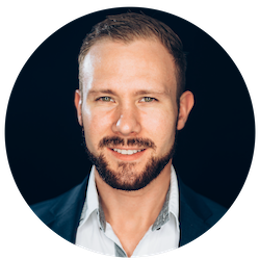 Now Get Out There and Create a Landing Page that Converts! 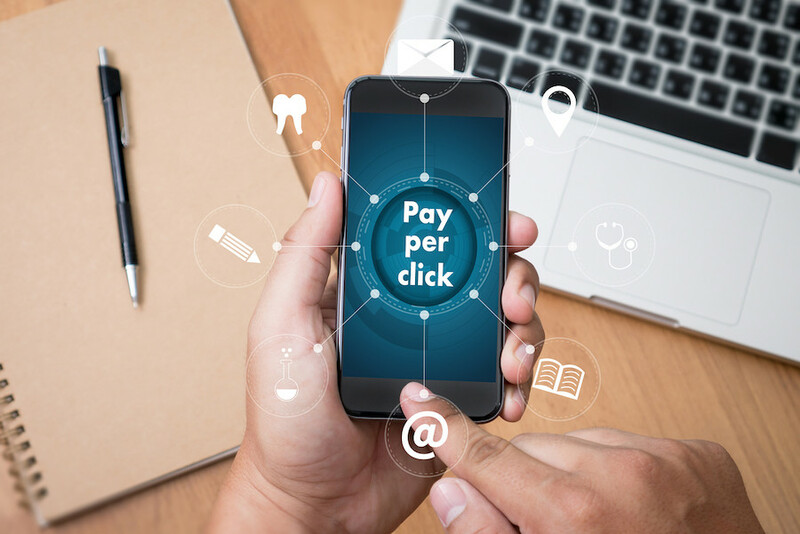 Pay Per Click marketing through the Google Ads platform is all the rage in 2018 – and for good reason. According to Wordstream, 65% of clicks from Google search queries with heavy commercial intent go to one of the top 3 paid ads. Considering there are an estimated 63,000 searches made every second, that’s a lot of eyeballs. But getting into the top 3 and earning those clicks is only half the battle. Once you’ve captured someone’s attention, you still need to convince them to do business with you. In this article, we’re not going to talk about how to optimize your Google Ad account or how to get people to interact with your Ads in SERPS. Instead, we’re going to talk about how to create a Google Ads landing page that seals the deal and turns interested visitors into paying customers. There are three basic elements of creating a landing page that motivates visitors to become customers. The basic structure, the copywriting, and the design. Independent of one another, none of these are going to maximize conversions by themselves. 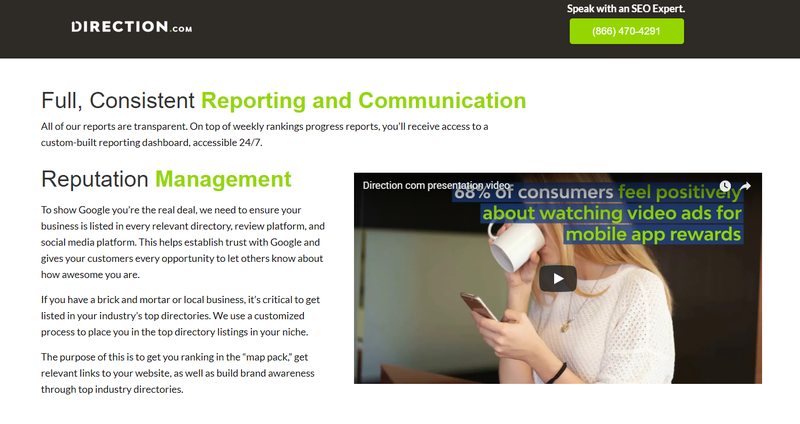 A great looking page with awful copy will make users bounce. Amazing copy on the world’s ugliest web page isn’t going to reach its full potential either. Even with an awesome landing page and rock-star copywriting, a user who doesn’t know how to get in touch isn’t going to. See where I’m going with this? The first step in creating a great landing page is taking the time to understand the basic structural requirements. Most effective landing pages include a clear and compelling headline that invites web visitors to keep reading. The next component is the body copy (more on copywriting later), which is designed to motivate the customer by explaining how the product or service will improve their life or solve a problem they have. Then, there is a call to action that encourages visitors to take that next step and convert. Once you have those three components, everything else on the page appears “below the fold.” This means the user will have to scroll down to see it. Below the fold, we’re going to provide our visitor with additional information or features that might help them make their decision. Finally, we are going to integrate elements that help us establish trust and credibility with the reader. Your headline has two primary goals. The first is to let your visitor know exactly what you’re offering. Second, we want them to keep reading so they can discover everything else your landing page has in store for them. After you write your headline, ask yourself whether it accomplishes those two goals. The headline on this Google Ad for a DC property management company has the right idea. It says exactly what’s being offered and invites the user to continue reading. We’re going to talk more about this later, but the body copy should explain the benefits of your service. This can either be a few short sentences or a bulleted list. The call to action is how the user actually takes the action that you want them to take. Whether that’s calling you, filling out a contact form, signing up for a newsletter, or purchasing a product, you need to give the user the ability to take that action right away. East Coast Launchpad is a perfect example. Notice how the phone number is located in the top right corner of the page so that users can click to call right away? You want those calls coming in! Users who don’t want to call can submit their contact information via the form. And it’s presented with a simple but appealing style that looks great and takes people right where they want to go. 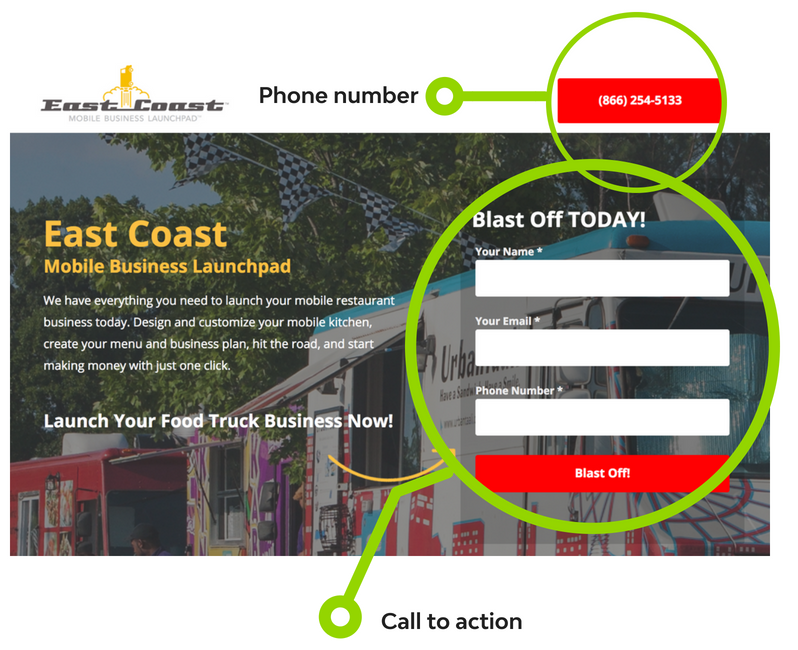 Don’t make your visitors jump through hoops to convert, your call to action should be immediately visible on your landing page. Above the fold, we have the headline, a brief introduction to the product or service’s benefits, and a clear call to action. Below the fold, we are going to give our readers more information including the product or services’ features, information about the company, and customer reviews. One thing we can do is provide a simple list of specific services or features offered. This list lets the user know that they have come to the right place. For example, I might have searched for an electrician, but what I’m really looking for is someone who can install a generator. 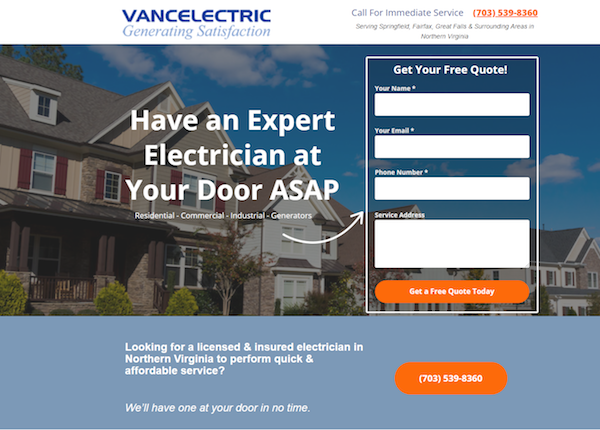 After clicking through to this ad, it’s immediately clear above the fold that I have found an electrical contractor. Scrolling down, I see a list of services provided and walla! 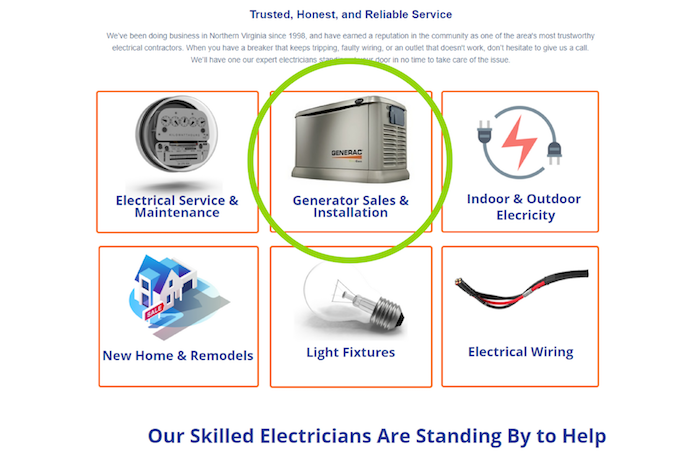 Generator installations are one of the services VanceElectric offers. I just have to hit the call button to speak with a sales associate. For a features example, let’s look again at East Coast Launchpad. Their product has unique features like detailed walkthroughs, modular designs, service contracts, and business development options. Let users know that they have not only come to the right place, but they have arrived at the best place ever! Customer testimonials and media exposure prove that you’re an authority in your industry. 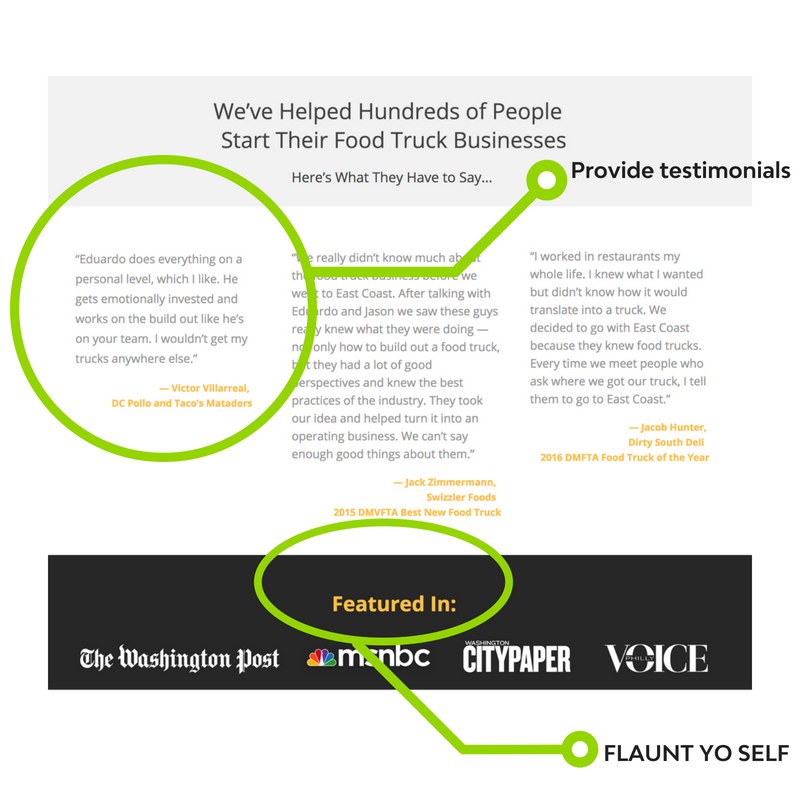 Plus they look great and provide a form of social proof to boost users’ trust in your product. East Coast Launch Pad takes advantage of both. Not only does the company routinely satisfy their customers, but several well-known media outlets have featured their work. It’s apparent that they know what they’re doing, and I can feel confident that when I click that call button, I’ll be speaking to an experienced professional. The second chapter of this guide will focus on your copy. We’ve gone over the basic structure of the landing page. Now it’s time to think about what we want to tell our future customers about what we are offering, and how their decision to do business with us is going to impact their lives. In the basic structure segment above we talked about where to place your features and benefits. Now we are going to discuss the difference between these two elements and how to weave them into your copy and create a compelling message. In general, a product or service’s benefits are more powerful than its features. However, features might be the difference between two products that offer a consumer similar benefits. Benefits are the ways that any given product or service will enhance the customer’s life. Features are mechanisms by which the benefits are made possible. The main benefits of driving a Jeep Wrangler are the ability to take the vehicle off the road and experience all the fun and excitement waiting for you there. In Jeep’s advertising, this sense of freedom and adventure takes the spotlight. Just like in this ad, we want our product’s benefits to be front and center on our Google Ad landing page. 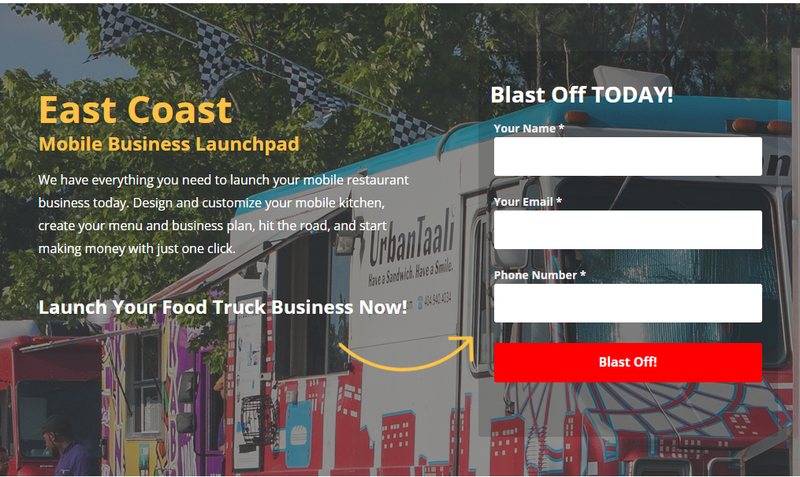 Going back to East Coast Launchpad, the number one benefit of their service is that the customer has a one-stop-shop for launching their food truck business. In other words, they can hit the road and start making money right now. As mentioned before, the features are the mechanisms by which our product provides the benefits to the consumer. For our Jeep Wrangler, many things make it capable of finding adventure off the road. These include its powerful engine, safety features, suspension, and washable interior. Start by showing your reader the value you can provide them up front. 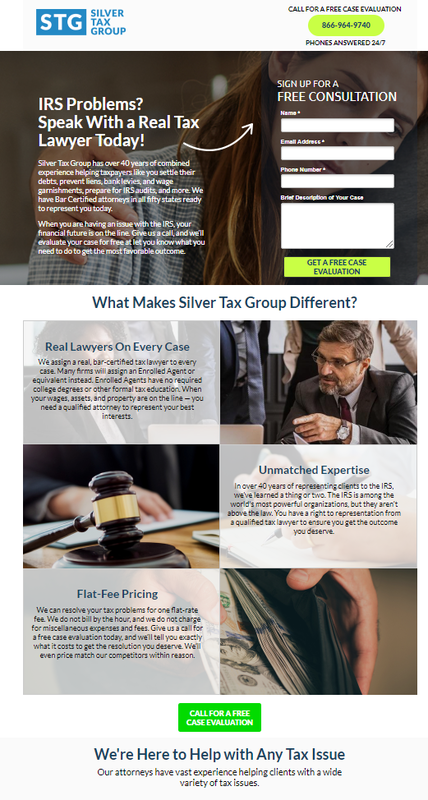 Place your benefits in the body copy at the top of the page. Place your features and any other information you feel is necessary below the fold. In today’s increasingly global economy, customers have a wide array of choices when it comes to selecting products and services. If you want web shoppers to be loyal to your brand, you have to give them a reason, and that means establishing your unique value proposition. Also known as a unique selling proposition, a value proposition is a clear, usually short statement that reveals how your product benefits customers and solves their problems more effectively than a competitor’s product. In researching your value proposition, study your own website as well as those of similar brands on the market. East Coast Launchpad does something unique in their industry. They don’t just build you a food truck and leave the rest to you. 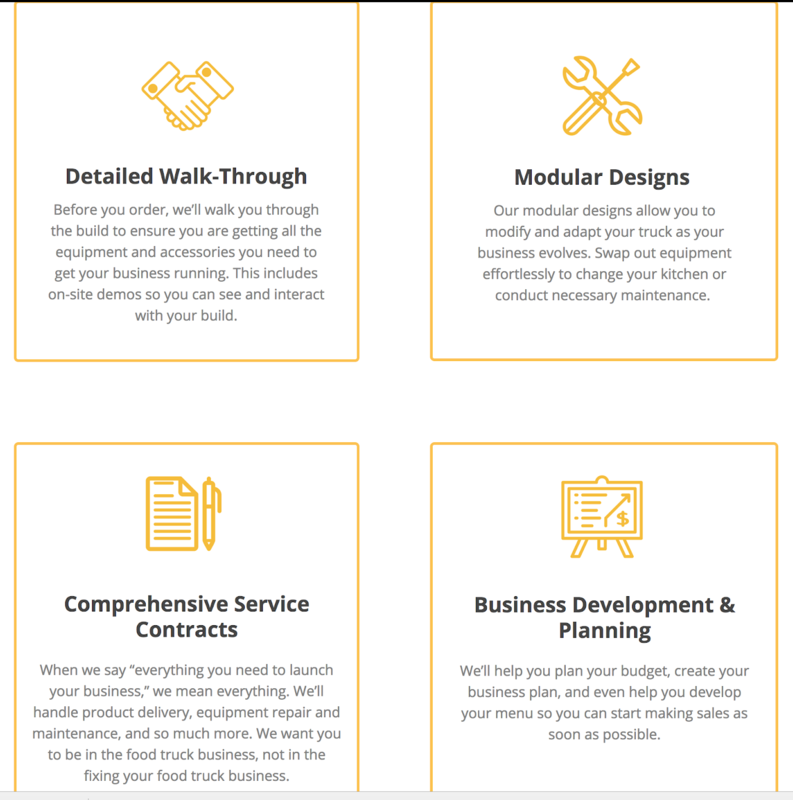 They help you with business development and menu planning. There’s a bunch of companies that can build you a food truck. But this one offers me business development, menu planning, and more? Sign me up! Once you’ve identified your unique value proposition, you can weave it into your copywriting to create a clear and compelling message. 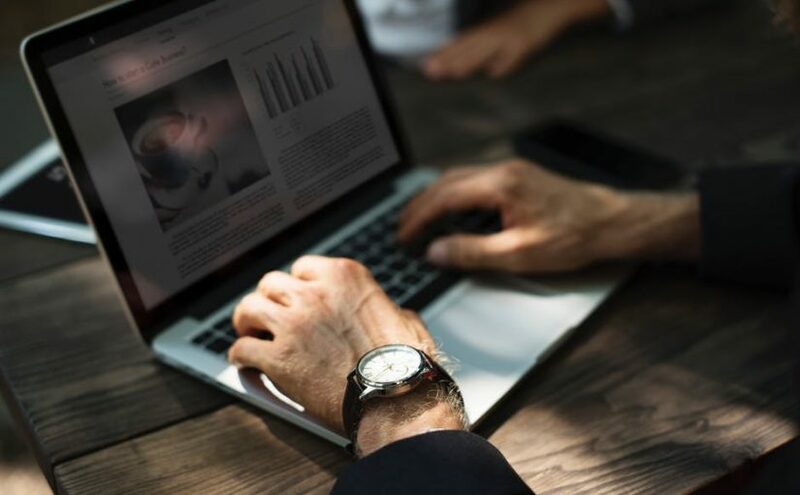 Short and sweet might be the trend in web writing, but studies show that longer pages can result in more conversions – 220 percent more to be exact! More detailed, longer pages give marketers more time to explain precisely how their products can fulfill customers’ needs and desires. However, if you opt for a longer page, be sure to incorporate different kinds of content so you don’t overwhelm buyers with a wall of text. Strive to include a healthy mix of text and subheads, images, and videos. In the end, you should utilize as many words as necessary to answer your readers’ questions and provide them with a reason to try your product over a competitor’s. Longer landing pages can be effective because you have more space to sell your product and address customers’ concerns. However, that doesn’t mean you should stuff your sentences with every adjective imaginable to describe your services. And, of course, you should avoid distracting content like excess menus, buttons, and unrelated links. The last thing you want to do is give your buyers an excuse to navigate away from your website. Even if your products are top notch and your landing pages well crafted, you might not be seeing the conversion rates you crave. If your web visitors aren’t taking that next step in the buying cycle, the problem might be that you’re not using the right messaging. The best vernacular to use on your landing pages is the one used by your customers. 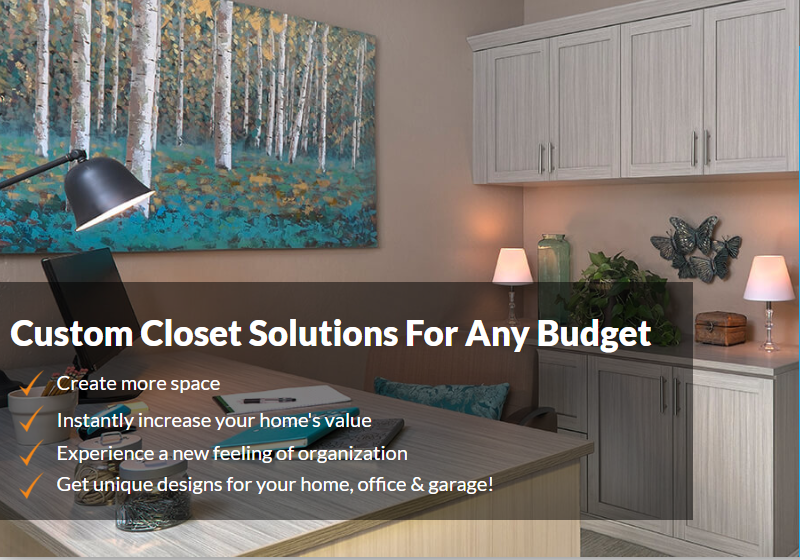 Find out how prospective buyers talk about your products and services by visiting online forums, social media pages, and review sites. When you describe your products on your landing page, be sure to use the same terms. The last important element of a Google Ad landing page is the design and user experience (UX). The visual aspects of your page will draw your reader in, and the UX will govern how they interact with the page. For landing page user experience, you can throw (almost) everything you’ve learned about website user experience out the window. 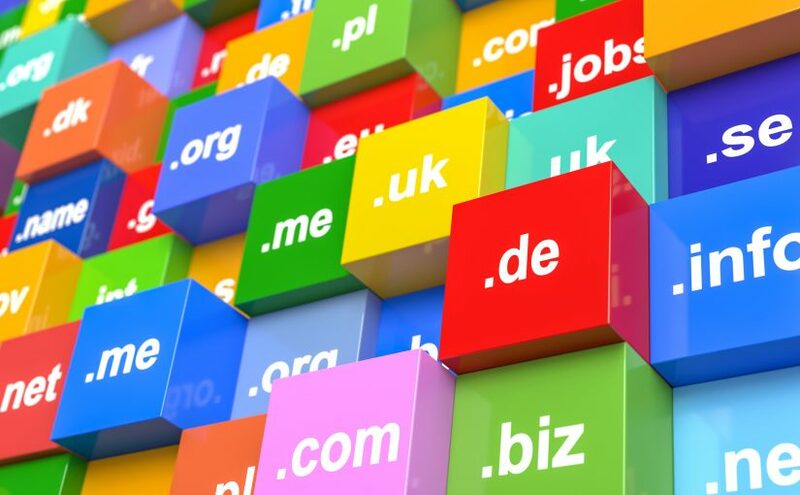 Websites exist as large, full-fledged digital webs with multiple options and pages. Your goal with a website is to provide the user with a seamless experience as they navigate from page to page, and a quick route to the information they’re looking for. With landing pages, you have only one goal: conversions. You want the user to click on that call-to-action. With that in mind, here are some good practices for landing page design and user experience. It’s 2018, and people don’t have any patience for outdated Web 2.0 design. Since Google made good design a ranking factor, the internet has become increasingly more proliferated with clean, aesthetically pleasing websites. Good design establishes trust. Users have grown used to good aesthetics and can instantly recognize a bad site when they see one. In fact, Google’s own studies have shown that people are capable of judging a website in milliseconds. This is because the human brain processes visual information many times faster than written information. Use those milliseconds to your advantage and design something clean and familiar. Your visitors will be far more likely to stick around long enough to answer your call to action. Remember how we want to ‘beat the bloat’ with our copy? The same is true for our overall design. It’s a designer’s job to negotiate the copy. You won’t be doing yourself or your writer any favors by mashing everything together into one intimidating wall of text. Be sure to break up the page into sections, and the copy with images and icons. Utilize the fact that all users scroll and allow them to scroll down and discover more instead of trying to clutter up an immobile page. 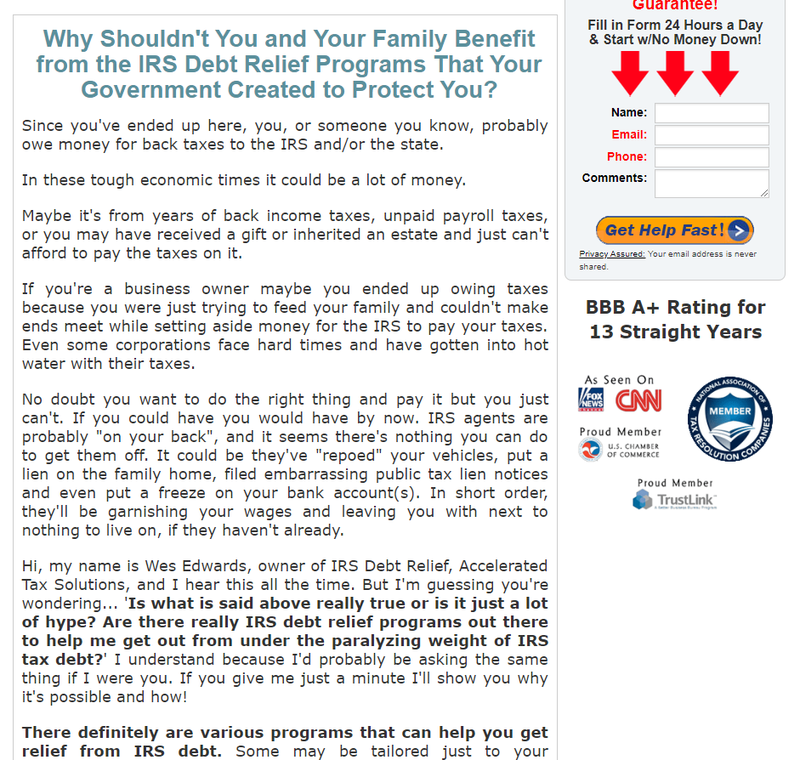 For example, this Google Ad landing page for tax relief is way too cluttered to offer a positive user experience. Compare it to this one in the same industry, selling essentially the same service. Without reading one word of copy on either page, which one of these providers would you rather work with? Every digital material you put out online reflects onto your brand. Landing pages and display ads act as touchpoints for users who have never come into contact with your company. Keep in mind that landing pages serve as miniature representations of you and act accordingly. Even if a user doesn’t click that call to action, creating a memorable landing page with strong branding will keep you in the back of their mind for when they seek out services in the future. However, if you’re advertising a product, such as a book or software, that caters to a different demographic than your general brand, consider switching it up to attract the users you want to convert. If the idea is to get users to convert, the button they use to do so should be apparent on the page and visible at all times. 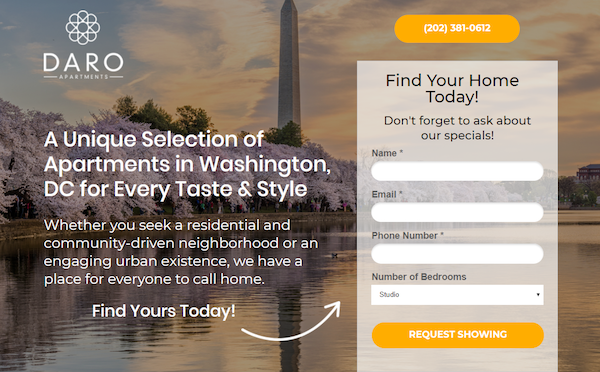 Use high-contrast colors to make the call-to-action stand out from the rest of your page. Consider using a sticky call-to-action that stays at the top of the browser as the user scrolls down. That way, the button follows them no matter where they are on the page. Eye tracking studies have helped us understand where users look first. These studies help us understand where users look first and the most, so we can place the most important information or elements within their natural eye patterns. The most distinct patterns we’ve seen are the F-pattern and the Z-pattern. For pages with a lot of content, you’ll want to follow the F-pattern and place the most important information within the red zones — usually the beginning of paragraphs and sentences. For less saturated landing pages, the Z-pattern comes into play as users bounce around with a quick eye scan. You’ll want to place your main content in a zig-zag pattern on the page to accommodate their eye movements. At the end of the day it only takes a second for users to lose interest in your landing page, so place the main takeaways where their eyes are guaranteed to jump first. Here are some heat maps created by tracking users’ eye movements to show you how this looks in action. In this guide, we covered the three essential elements that make for compelling Google Ad Landing pages. Google Ad account management is only half the battle. It doesn’t matter how many eyes are on your ad if you fail to connect with the people behind them. 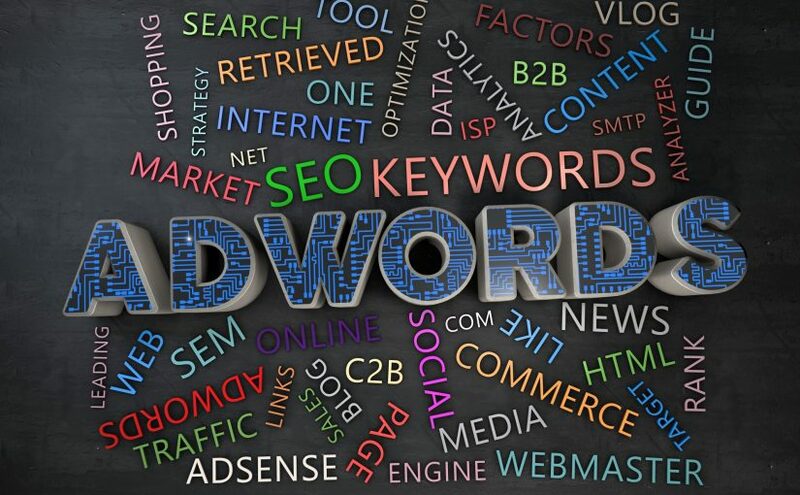 It doesn’t matter how low your cost per click is if you don’t earn any conversions. Creating effective landing pages isn’t easy. Here at Direction, every landing page we create is a collaboration between a paid advertising expert, a copywriter, and a graphic designer. If you need any help creating your landing pages or managing your Google Ad account, don’t hesitate to reach out to us.